A question was asked this week about two flute students who were also ballet dancers, and how they played flute with a rigid and non-musical posture. More recently, a flute student wrote in about embouchure tension and what to do with a tight upper lip. Herbert Whone on Feeling Awareness in Music Students. Please feel free to print it out and give it or send it to your students. The information is about becoming more aware from the inside. Musicians need to become more aware to free tension, and to feel what they are doing, using their conscious minds. This is a large and interesting topic, and I welcome comments and feedback. 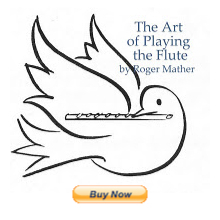 Click on COMMENTS below, or subscribe to this blog (scroll down and click SUBSCRIBE to notify you of future topics) if interested in flute teaching or flute development. I just read the whole thing, and it is fabulous! Very very interesting stuff to think about and to put into practice. Thanks for sharing it!